Smog has all but choked the life out of Shanghai Friday, as authorities issued the highest possible health warning for the city. Hundreds of flights were delayed or canceled, schoolchildren were forced indoors (where conditions weren't necessarily much better) and visibility was reduced to only a few dozen meters. The concentration of PM 2.5 particles, which pose the greatest risk to human health, reached 602.5 micrograms per cubic meter Friday afternoon. The U.N.'s caps the safety limit at 25 micrograms. Real-time updates on cities' readings can be found here. The smog has been building all week. 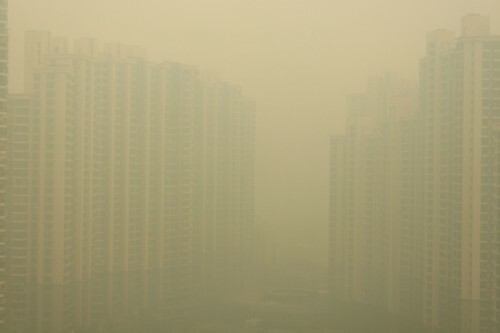 Shanghai's marathon took place Monday to "severely polluted" air quality, likely harming participants' lungs. By Friday, all public sporting events had been canceled. Most of the pollution, Greenpeace's Energy Desk explains, is coming not from within Shanghai but from heavy coal-burning regions -- mass air movement is carrying the fine particulate matter into the city. Car exhaust is also contributing to the problem; as PM 2.5 reached hazardous levels, officials halted all construction projects and pulled 30 percent of government vehicles from the road.